Chapin and I had a nice weekend together, doing things just the two of us. 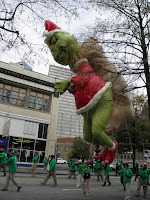 It all started Saturday morning when we walked down just a few blocks to see the Atlanta Children's Christmas Parade. We were actually able to see the parade start marching down the street, since it kicked off not even two blocks away from us. Sometimes we don't realize how fortunate we are to live right in the city! George actually got quite a bit of attention from all the people lined up in the parade. One person would see him, then nudge another, and soon you would hear snippets of, "Look at the pug!" 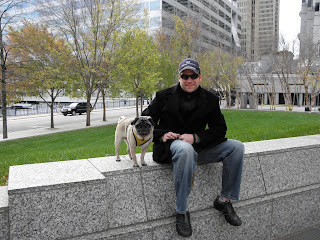 Well, he is quite a handsome pug! The afternoon was focused mainly on the SEC Championship: Auburn versus South Carolina. Chapin watched the game from home, and George -- in his Auburn shirt -- brought lots of luck to Cam Newton. After the game ended, Chapin and I went out to eat at our favorite Italian restaurant, Nino's, to celebrate Chapin's birthday. I used the evening as an excuse to wear my Jay Godfrey Lafayette dress, which has been seen (in other colors) on celebrities like Kim Kardashian. I wish I had a picture that included Chapin, but unfortunately the batteries in our camera died before he could get in the photo!